Do you like Free Stamps and supplies? Do you like a Great Deal? then the Mystery Box is for you! Purchase $100 in FSJ product, and receive a FREE Mystery Box filled with at least $50 in retired product. WOOHOOO. Thats a Free Mystery box with a $100 order. One box will be automatically added to your order for every $100 spent. 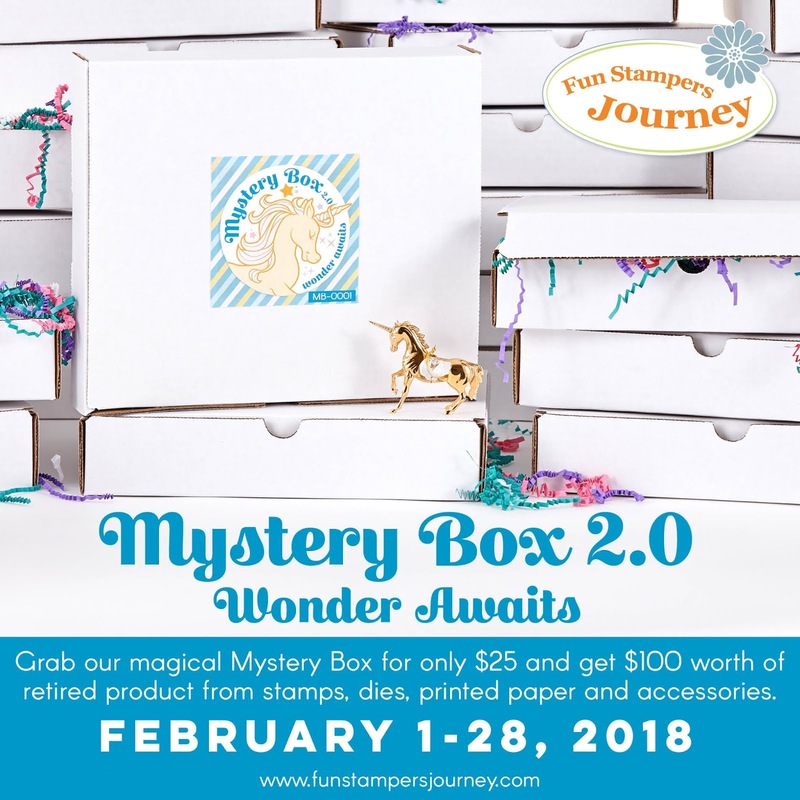 Purchase just the Magical Mystery Box (MB-0002) itself for $25, and receive over $100 worth of product! You get $100 with for Fun Stamping supplies- stamps, paper, dies, embellishments!!! for Just $25. WHAT A DEAL!! Need to Stock up? order 4 Mystery Boxes for $100, get a 5th box for FREE. Ummm….Thats $450 worth of Stamps, dies, paper, embellishments for Just $100 (plus tax and shipping)! AND: Five people will receive a Golden Unicorn in their Magical Mystery Box. Winners will get a Journey Girl Signature Tote Bag filled with current product (over $175 value)! The layout may be similar to the other Bday Wall cards I have shared. Its simple and my favorite for this stamp! These colors are perfect for a masculine birthday! I stamped the Sentiment in Limeade Splash then lightly shaded the background with Light blue PanPastels. Then I added some yellow PanPastels to the corners and when it blended it turned just the right shade of green!